We want to introduce you an important tool in our system. It is the tab Keyword Analytics. 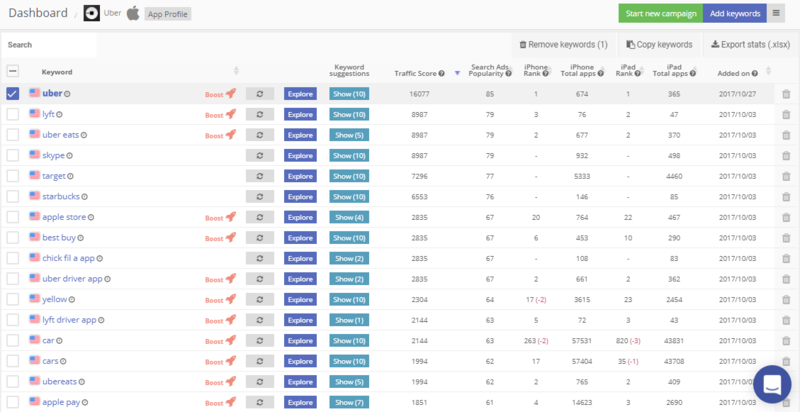 It allows you to see statistics on search requests. When you add an app, the tab opens. At that moment you can see the page Keyword Analytics. Here, you can do different actions. It helps you to create semantic core and improve your app. Now I will show you what you can do. 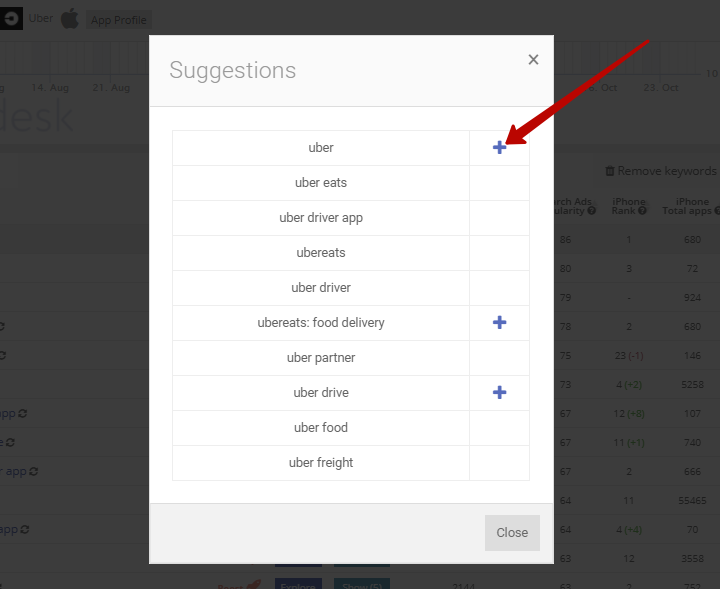 When you add keywords, you will see the list of keywords and the data on them. 1 column - added keywords. Look at the tab Search. Here you can enter any keyword and the system will find it. Also you can enter one part of the keyword and find requests with similar symbols. Here you can start boost for any keyword. Click on the icon "Boost". 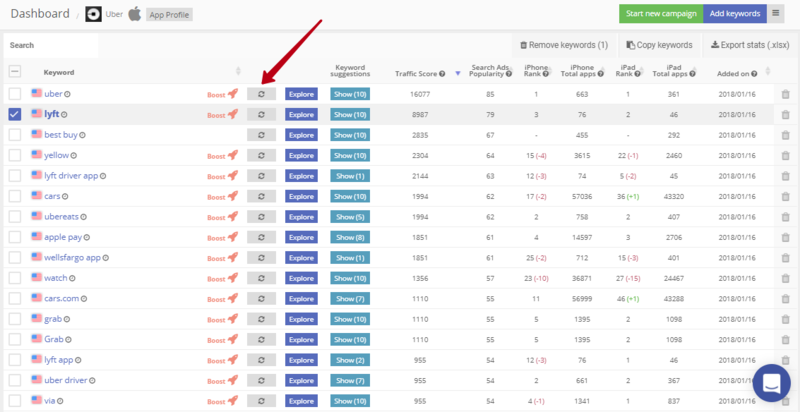 Near every keyword, you can see an icon of the update, if you have the plan Business and higher or Individual. This tool helps you to update any keywords instantly. To learn more about Manual update keywords. Also you can see the last date of any keyword's update. 2 column - Click on the button "Explorer"
The tab Keyword Explorer will open for any keywords. Check every keywords in this tab. To learn more about this tool. 3 column - Keyword suggestions. When you click on the button "Show" you see the Store suggestions. Choose and add. Click on the icon "cross". 4 column - Traffic Score. Estimated number of users enter the keyword in the selected country per day. Our algorithm takes into account a lot of data such as the presence of requests suggested, its position relative to other keywords and also the results of a large number of conducted campaigns. 5 column - Search ads Popularity. 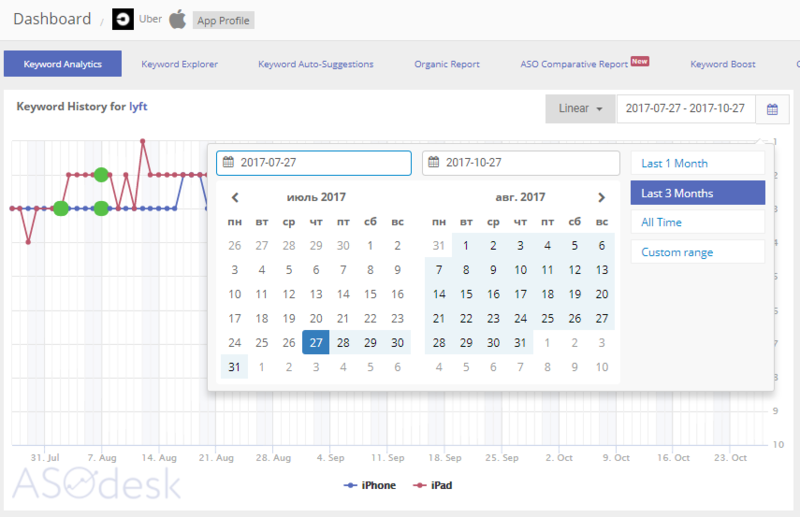 Apple provides Search Ads data that includes the keywords which people searched on before clicking on the ads, it helps the app's publishers to understand their potential users better. 6 column - iPhone Rank. It shows the position of the application on the current request. We update keywords in our system 1-2 times a day. 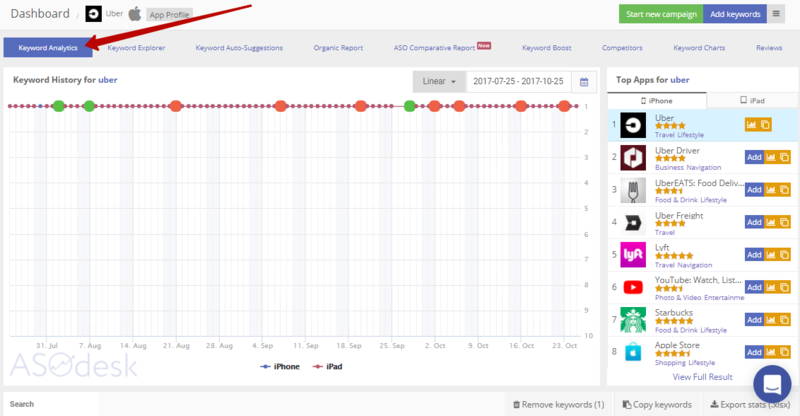 Also, you can see the history of the position of any keyword on the graphic. 7 column - iPhone Total apps. Some apps are available by search phrase in the selected country. 8-9 columns - data of iPad. 10 column - the date when the keyword was added to this application in your account. Remove one keyword or any keywords. You have some ways for doing it. 1) Select the keyword that you want to remove. Click on the icon "recycle bin"
2) Mark the keyword that you want to remove, and click on the button "Remove keywords". Also, you can select all keywords and remove them. Select all keywords and click on the button "Remove keywords". Copy keywords and set into another app. It is needed when you have many apps and you want to monitor everything at once. 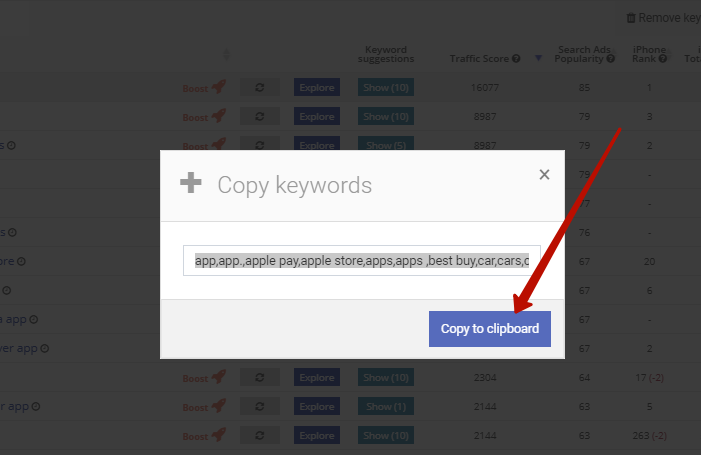 Click on the button "Copy keywords". Click "copy to clipboard". You can apply to other Documents too. To learn more about "Copy keywords". 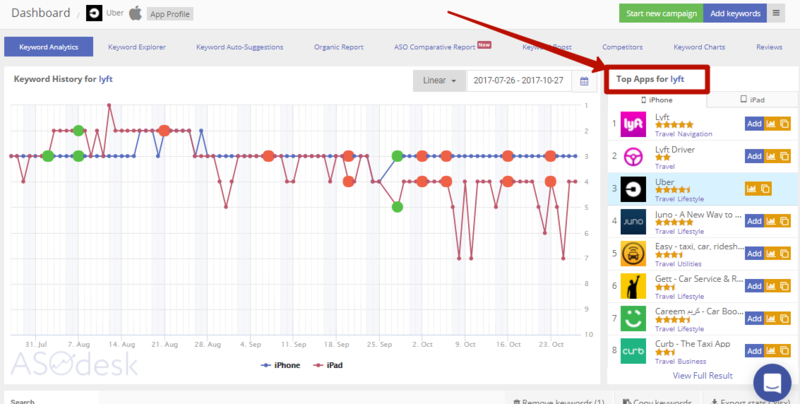 You need to monitor your keywords over a month or over a three-month period to know the situation. It's important to understand which keywords you should continue using and which keywords you should delete. 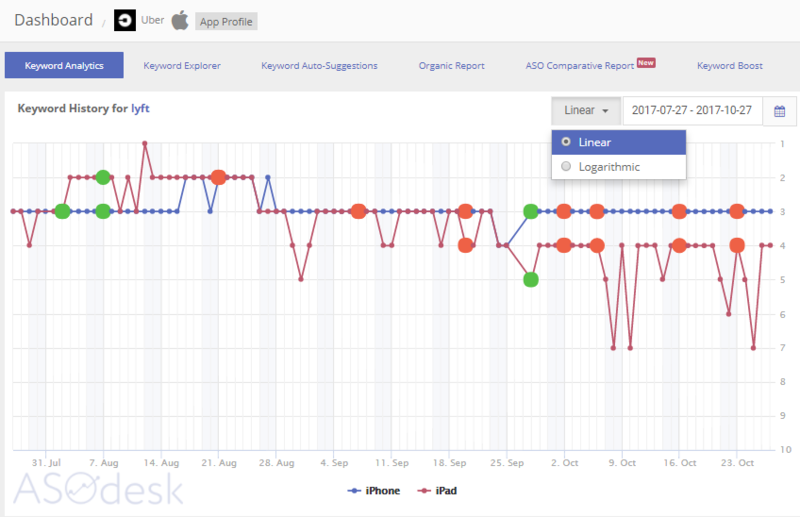 You can get the report of all your keywords, Users per Day, positions over a three-month period. If you click "Export stats", you will get the Excel document with the report. 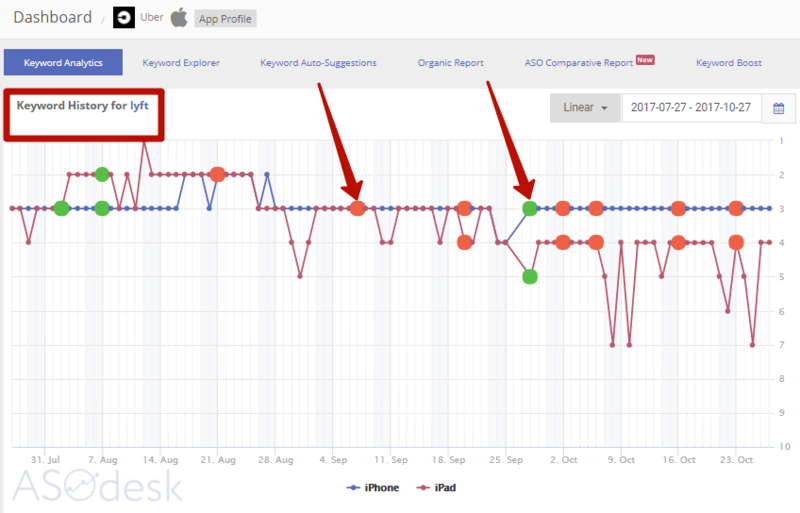 Keyword history for any keyword will allow you to look a rank of your app for a certain period. Here you can see the big green dot, this is the meta update, which is a description of the application. So when you make changes in the description, information is displayed as a green point on the line chart at once. You can also see the red dot. This is the application update. Also configure the period for which you want to see a graphic with the data. This is the Top list of apps for any keyword. Click here and add Competitors. remove the application and other interesting things.